On June 28, 2013 two mute swans were seen swimming together in the northern part of the lake. They are all white, and gorgeous. At least one swan has been seen on the lake, at various times, as far back as late May. You may recall that we had four swans last summer. For a photo from last summer, see the post from June 2012. We have had two, and sometimes three, loons residing on Canobie Lake this summer. In early June one of the loons climbed up on the raft, made a nest, and stayed there for several days according to Dave Blake, our loon watcher. Then she left. We don't know why. But it appears we won't have a loon chick this summer. When we have more information from the Loon Society, we'll let you know. We understand they were seen again on the lake, a couple of times after the 19th. They were diving, presumably fishing, in the main part of the lake not far from the park. 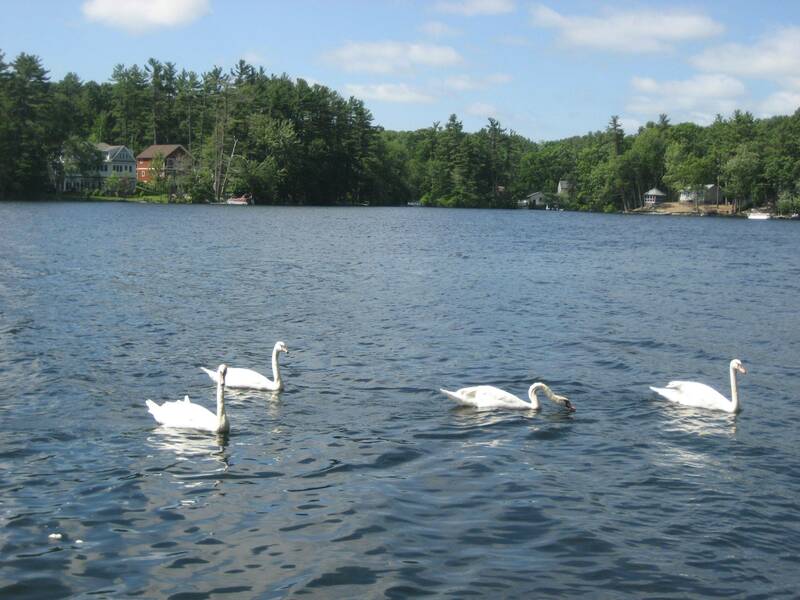 On Saturday June 16 four mute swans appeared on Canobie Lake. Mute swans are very large (larger than canada geese) and all white. They are very striking, as you can see from the picture. For a higher resolution picture, Click Here. A single mute swan has been seen every few years on the lake, but usually doesn't stay long. These four are still here, as of Friday June 22. We don't know if they're just passing through, or looking for a place to nest. If you know more about mute swans and their habits, please let one of the Board members know. And if you are out on the lake, please stay a respectful distance away since they are wild animals.